Earlier this month, Nestlé Pakistan signed an MoU with the Ministry of Climate Change to make a contribution in the Government led Clean Green Pakistan initiative, which was launched in October 2018 by the Prime Minister, Imran Khan. Clean Green Pakistan is a comprehensive movement kicked-off by the Ministry of Climate Change which focuses on liquid and waste management, hygiene awareness, access to drinking water, tree plantation, and solid waste management. By partnering with the Ministry of Climate Change, Nestlé aims to contribute towards environmental well-being by engaging the public and raising awareness. Clean Green Pakistan campaign aims to plant 10 billion trees over the course of 5 years across the country. Nestlé Pakistan has pledged to make a contribution by planting 50,000 across the country in 2019. 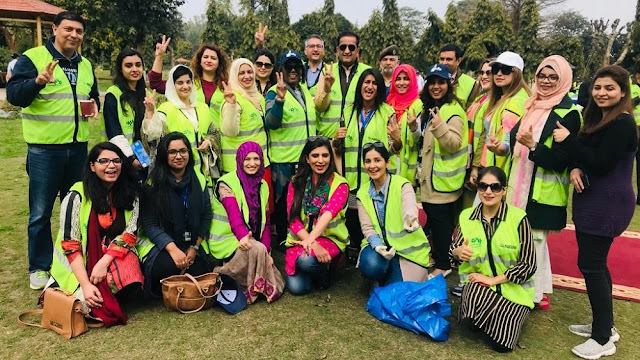 In doing so, the initiative took off with a cleanup and tree plantation drive in Lahore. Malik Amin Aslam, Advisor to Prime Minister of Pakistan for Climate Change, Babar Hayat Tarar – Additional Secretary, Ministry of Climate Change and Hammad Naqi Khan, Chief Executive Officer -WWF Pakistan attended the first plantation activity. Hundreds of children from The Trust School and Nestlé employees were part of the plantation and cleanup drive too. This is the first of many more plantation drives to come. “We have a target of planting 10 million trees in the next five years and all of you have to be ready in helping achieve this target as this is not just about the government or the Ministry of Climate Change, it is also a collective action that all of us, including corporate organizations and all the citizens, have to help us take”, said Malik Amin Aslam, Advisor to Prime Minister for Climate Change, while talking to the crowd at the launch activity. It was followed by cheers from the crowd, a positive sign that Pakistanis are ready for this challenge and are committed to creating a Clean Green Pakistan. Nestlé Pakistan as part of its global and local commitment is striving towards zero environmental impact of our operation. We appreciate Adviser’s and PM’s vision towards a Clean Green Pakistan. Today we are starting our journey for 2019 with the first Cleaning and Tree Plantation Activity under our Employee Volunteer Program. The purpose of the activity was to create a sense of ownership and responsibility and encourage citizens to play their part in reducing plastic waste and environmental pollution. Nestlé has been working on achieving the United Nations Sustainable Development Goals set for 2030 with its various programs that have been positively impacting society. This initiative is completely aligned with Sustainable Development Goals (SDGs) including Clean Water and Sanitation, and Life on Land.